"We announced a comprehensive reform of the education system several months ago at Ikalto Academy and declared the sector as a strategic priority for the development and advancement of the country. We all agree that education and science is a foundation for the future of our country. Today, when Georgia aspires to regain its place in the European family, significance of education is once again becoming crucial along with the introduction of high, European standard of education. A lot of challenges are faced by Georgia: occupied territories, internally displaced people, poverty, scarcity of infrastructure, necessity of wide-scale investments in various sectors of the economy. In my opinion and strong belief, the best response to these challenges is a creation of a roust education system and boosted human capital. The latter will enable us to develop Georgia with very high speed. Only the educated, motivated and self-sufficient generations will bring progress and development to our country. 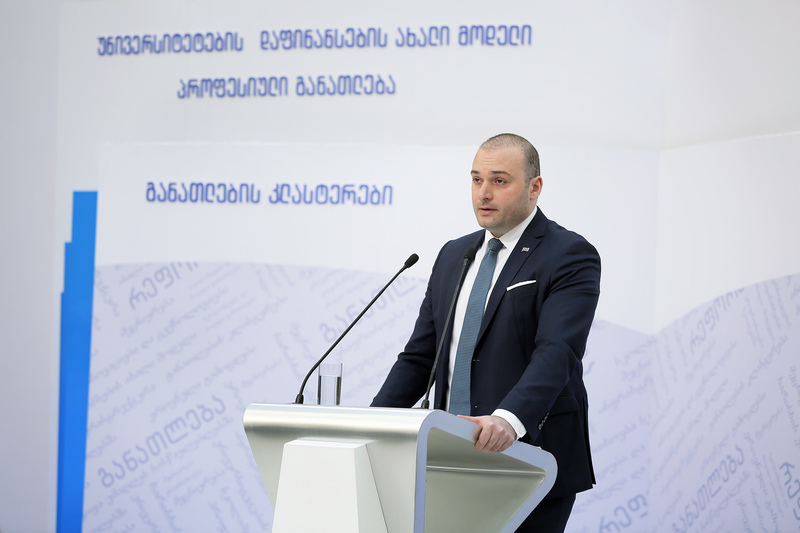 Years back, when I was a Minister of Finance of Georgia, I stated at multiple occasions that it is essential for the state to invest heavily in the education sector. It is exactly what our team in the Government of Georgia prioritizes. We aim to reach at least 10-12 percent of the overall economy to be contributed by the education sector. We divided the reform of education system into phases and ultimately, when we complete all of them - and I pledge that we will indeed complete all the phases - education sector will dominate in our economy, which will contribute at least 10-12 percent in the Gross Domestic Product (GDP). This reform, similar to any change and novelty, has its supporters and antagonists. I am confident that we both - and in fact all of us - share one goal to succeed in having a streamlined and unsurpassed education system in the country. We will by all means achieve the best results and it will be our response to sceptics. All our efforts are targeted at the satisfaction of public demand and achievement of results as efficiently as possible. Today, we are presenting the education reform to general public and believe that it is fully attuned and accurately reflects our reality and challenges that we have in the education system. Reform covers all five tiers of education: early childhood and pre-school, general schooling, vocational, higher and science. A number of tangible steps have been made already in many directions and foundation has been made to significant developments. Nevertheless, I need to sincerely confess that problems in the education system and science are still a lot and it is impossible to overcome these challenges without radical adjustments. Deficit was created in the education sector of the country over years, which needs to be addresses immediately. The most pressing challenge is that economic development has been distanced from education and science. It is the greatest blow on our economic potential. These two directions are decisive in the Development Strategy of Georgia. Both of them together should ensure the accelerated development of our country, economic advancement and reform in the education sector. We may deem it as a common strategy consisting of two components. Our priority, as laid out in the new reform concept, will be the place and status of a teacher in the public perception. Remuneration of teachers will become adequate. Special attention will be made on the children with special needs, inclusive education and their integration in the school environment; safe, violence-free and refurbished school setting will be ensured; new schools will be built and existing ones - rehabilitated. This year we increased the State Budget Allocations by 2.5 times towards this end. I do not wish to see only so called elite or prestigious schools in Georgia. Every single school should be successful and of very high quality. Special attention will be paid to regions, which are characterized with more vivid problems - both in terms of infrastructure, human resources and other dimensions. Education and science is a complex system, consisting of many inter-related components, which require fundamental and wide-scale approach. Therefore, Georgian experts and education subject-matter specialists were actively engaged in the reform design and development process. International organizations participated in it as well: United States Agency for International Development (USAID), World Bank, International Monetary Fund (IMF), Asian Development Bank (ADB) and almost all donor agencies and our international partners. I wish to thank all of them for their huge contribution to such a wide-scale reform. As for the higher education, our goal is to integrate it in the international education space and quality improvement is thus implied in the reform. Moreover, you may well be aware that we have a Development Strategy, which implies the transformation of Georgia into a regional hub for international business, tourism, transport and - what is most important for me - education. We have historic roots in this and the reform component on higher education to be presented will assist us in attracting more foreign students to our universities. Vocational education and life-long learning is one of the priority areas of our reform. We are introducing a system, which will help individuals of any age in getting adapted to the fast changing world, acquisition of new professional skills, self-realization and development. We have already identified the professions, which are in great shortage currently and will be in high demand in our national economy in the nearest future. Care for science is one of our key priorities and special attention is paid to it in the reform agenda. It implies our integration in the international scientific space and increased funding for science. We will greatly incentivize young scientists. Presented reform implies the development of competitive professionals equipped with advanced knowledge and skills, oriented at long-term development. Modern world, new technologies and fast pace of changes requires humans to have new, diverse skills, practical thinking and ability to process information and quickly respond to problems, along with logical thinking. Reform has been developed with all these attitudes, aims and goals. We are presenting it to general public today. Methodology of the education sector reform and new approaches envisage a system that zooms down to an individual child, adolescent, youth and teacher. Minister of Education will further elaborate on every detail of the reform. I am confident that implementation of this reform will lead to a breakthrough in the education system and we will succeed in advancing Georgia to a new level of development. We will have competitive generations equipped with advanced knowledge, who will make their due contribution to the democratic and economic transformation of Georgia. That is how we will overcome poverty, reach welfare and join a group of advanced, developed countries by succeeding in the creation of a unified, strong and European state."